Finding South using Southern Cross stars. This is manual, analogue, computer that adds the effect of the wind to the aircraft speed to tell you what direction is will be going and what speed, assuming the weather forecast is correct. Alternatively if you can note what you have flown over and determine your track bearing from a map then you can work out the wind speed and its direction, as it has been affecting you. The front face of the gadget allows input of the aircraft heading, airspeed (through the air), plus the windspeed and the wind direction. Use the screw at the bottom to set your airspeed using the scale along the handle. Minimum = 100kts, maximum=300kts. Use the big nut on the back to rotate the entire top scale to set your aircraft heading. (0 = north, 9 = East, 18 = south and 27= west). 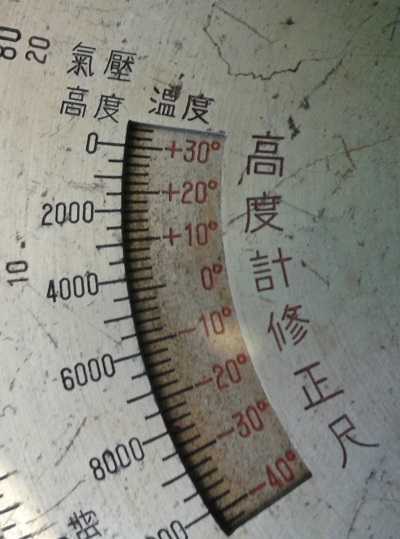 The scale number show the heading in units of 10 degrees. The scale tic marks shows individual degrees 0 to 359 deg. Set the wind direction using the double ended rotary scale. You can work this with your fingers on the front. Conveniently it shows an arrow with feathered wind barb. Turn this to match the origin of the wind and its destination. It is most important that you get this right. If air traffic control or the meteorogical people tell you the wind is "270 at 6" this probably means the the wind is coming from a bearing of 270 at 6 units of speed. 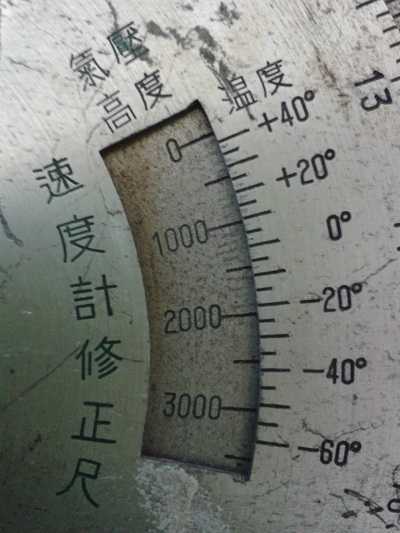 It is helpful to know if the winddirection bearing is the true bearing or magnetic bearing. Is the windspeed knots, m/s, ft/s or mph. Now to use the gadget simply slide the long pointer till is crosses the wind scale at the correct windspeed. Read off the ground speed (on the long pointer itself) and note the drift angle (-20 to +20 deg) along the curved line the bottom. The results are the track bearing over the ground and the groundspeed. airspeed = 250 kts. Heading =270 deg (aircraft pointed due west). Windspeed 30kts from the south east coming from 135 deg. Result: Groundspeed = 272 kts, Track bearing = drift is 3.5 deg to the right plus heading 270 so track is 273 deg. Directly into wind or wind from behind. Airspeed = 250 kts. Heading =0 deg (aircraft pointed north). Windspeed 30kts from the north coming from 0 deg. Groundspeed = 220kts, Track=0 deg. Airspeed = 250 kts. Heading =0 deg (aircraft pointed north). Windspeed 30kts from the south coming from 180 deg. Groundspeed = 280kts, Track=0 deg. Airspeed = 250 kts. Heading =0 deg (aircraft pointed north). Windspeed 30kts from the east coming from 90 deg. Groundspeed = 252kts, Track=drift 4deg left, so 256 deg (just west of north). Airspeed = 250 kts. Heading =0 deg (aircraft pointed north). Windspeed 30kts from the west coming from 270 deg. Groundspeed = 252kts, Track=drift 4deg right, so 004 deg (just east of north). On the back are three scales. The outer scale is simply a slide rule for multiplying or dividing numbers. Rather clever being circular, compared with the traditional straight sliderule. If you want to multiply two numbers, simply add the two distances, always going clockwise. The red scale is temperature. Outer scale is pressure altitude. Set pressure altitude (0 - 10,000 ft) against temperature (red deg C). e.g 8,000 ft a -25 deg C, Indicated Altitude = 8000 ft. Locate Indicated Altitude on the inner scale 80. Read off the True Altitude on the outer scale 84.5 means 8450 ft. Note that the altimeter correction is zero at zero altitude and 15 deg C temp. The outer right scale is temperature. e.g 8,000 ft a -25 deg C, Indicated Air Speed ( IAS ) = 130 kts. Locate Indicated Air Speed ( IAS ) on the inner scale 130kts. Read off the True Air speed ( TAS ) on the outer scale 137 kts. Note that the IAS to TAS correction is zero at zero altitude and 15 deg C temp.